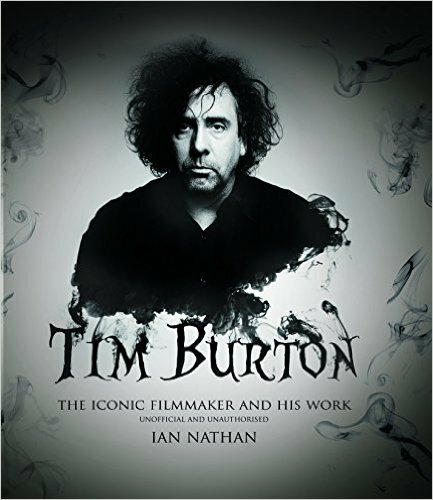 In the first of our Christmas gift ideas (Yes, it's that time of year) we bring you a rather classy coffee table book on one of the most iconic movie directors of recent time, Tim Burton. As mentioned this book by Ian Nathan oozes class. The book consisting of 176 glossy pages slides out of its box to reveal the director on the front and Jack from 'A Nightmare Before Christmas' on the back. The pages within are packed with behind the scenes photos and the book has information on each one of Tim Burton's movies. There's even a nice 4-page pullout in the centre of the book with a timeline of all his movies. The book reminds of 'Spielberg: A Retrospective' by Richard Schnickel. That book also covers each movie, maybe not in the greatest detail just like this book but that's no bad thing. It's a book you can read for a few minutes each day while enjoying your breakfast and at the same time you will pick up the odd fact you may not have known before on Tim Burton and his iconic movies. The book is currently priced at £19.99 on Amazon.co.uk and $30.85 on Amazon.com and would make a perfect gift for any movie fan. Tim Burton is one of the most popular and remarkable filmmakers of the last 30 years, being responsible for such films as Edward Scissorhands, The Nightmare Before Christmas, Corpse Bride and Alice in Wonderland. He is famed for the visually arresting style of his films that combine with highly original storylines. A truly international filmmaker, Tim Burton has carved a reputation as one of the world's greatest creative directors. This stunning treasury explores the influences on his development as a filmmaker and assesses how he has captured the fruits of his imagination on screen. Illustrated with many behind-thescenes photographs and stunning film stills, chapters analyse the success and style of films such as Beetlejuice, Ed Wood and Mars Attacks!, and examine how Burton breathed new life into wellknown stories that include Batman, Planet of the Apes and Charlie and the Chocolate Factory. Finally, the book looks towards the future and his upcoming films Alice Through the Looking Glass, Miss Peregrine's Home for Peculiar Children, and Beetlejuice 2. Tim Burton's entire filmography is presented across a stunning 8-page gatefold in the heart of the book. Packaged in a handsome slipcase Tim Burton - the iconic filmmaker and his work is a must for anyone who enjoys the creativity of films and is a fitting appreciation of one of Hollywood’s most dynamic movie directors. IAN NATHAN, who lives and works in London, has been a film writer, producer, broadcaster and magazine editor for twenty years. As executive editor of Empire, the world’s leading film magazine, he is allowed to feed his passions on a daily basis: generating, editing and writing articles as a thinly veiled excuse to provide the world with his opinions. Like any healthy cinema obsessive, he grew up on James Bond, Indiana Jones, and sneaking into horror movies when he was tall enough. It has grown into a magnificent obsession with everything from Hitchcock to Kurosawa, from arcane film theory to picking your favourite Harrison Ford punch. He has had the immense good fortune of traversing the globe, interviewing the great and good: watching the godlike Steven Spielberg at work, eating ice cream with Peter Jackson and a tableful of orcs, buying Sigourney Weaver breakfast, and being hugged by both Oliver Stone and Kate Winslet sadly, not at the same time. He has regularly contributed to books; newspapers such as the London Times and Independent; and magazines; had a weekly radio show; and produced TV documentaries and award ceremonies. The work of Sir Ridley Scott, in particular the extraordinary Alien, has been seminal in inspiring him to what film could be, and how much there is to discover within it. Tim Burton - the iconic filmmaker and his work is a must for anyone who enjoys the creativity of films and is a fitting appreciation of one of Hollywood's most dynamic movie directors.